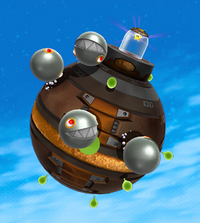 Silver Chomps are a type of Chomp in Super Mario Galaxy 2. They resemble giant silver Chomps with yellow irises and red pupils. 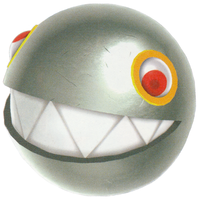 Unlike other Chomps, Silver Chomps always roll towards Mario and try to hit him. A single Silver Chomp first appears in the Rolling Masterpiece Galaxy as a mini-boss in the mission Silver Chomp Grudge Match. One later appears in the Slipsand Galaxy, in the mission Sailing the Sandy Seas. A total of four Silver Chomps later appear in the Battle Belt Galaxy on the final planet in Mini-Planet Mega-Run and Mini-Planet Daredevil Run. These enemies can only be defeated by Rainbow Mario, by pushing them off a cliff while on a Star Ball, or by the use of a rubbery bulb. An extremely large Silver Chomp appears in the E3 2009 trailer of Super Mario Galaxy 2, though it never made it into the final game. In the trailer, it seems to be acting similar to Sorbetti during the boss battle in the Freezy Flake Galaxy. This page was last edited on March 4, 2019, at 14:14.